On exhibit through May 3rd at the National Gallery of Art in its West Building are two installations: American Masterworks from the Corcoran, 1815-1940 on the main floor which features 29 paintings and two sculptures and Focus on the Corcoran: Works on Paper, 1860-1990 on the ground floor. I was invited by The National Gallery of Art to give a presentation for the Winslow Homer exhibit with Chief Curator Franklin Kelly and Conservator Janet Walsh. I was also invited by The Corcoran Gallery of Art to give a gallery talk with Bechhoefer Curator of American Art Sarah Cash for the John Singer Sargent exhibit, Sargent and the Sea. I am familiar with both museum collections so it was of particular interest to me to see some of my favorite Corcoran paintings hanging at the National Gallery in a different light. The exhibit opens with Sargent’s painting En route pour la pêche (Setting Out to Fish) which was the centerpiece for the recent Sargent and the Sea exhibit at the Corcoran. I have a personal connection to this painting as Curator Sarah Cash, who organized the Sargent and the Sea exhibit was researching the exhibit in France while she was also curating and helping install my exhibit Barbara Ernst Prey; An American View in Paris at the Mona Bismarck Foundation. In the first room of the exhibit is another Sargent painting displaying his dashing brushstrokes, Simplon Pass (1911). Also in this room is Frederic Church’s Tamaca Palms (1854) and Sanford Robinson Gifford’s Ruins of the Parthenon (1880). I can’t help but return to examine Gifford’s painting up close as I am currently painting architectural subjects — and can’t help asking myself, “how did he do that?” Also not to be missed is Hopper’s painting Ground Swell. 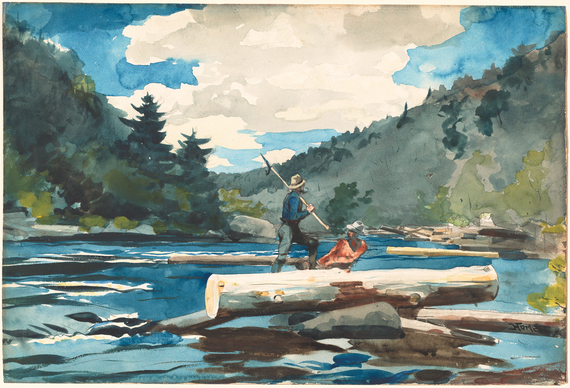 The works on paper exhibit has another Sargent watercolor, Campo dei Friari (1880/1882) included with two exquisite Winslow Homer watercolors, Young Woman Sewing (1876) and Hudson River, Logging (1891/1892). The colors in Homer’sHudson River, Logging are fresh and strong and haven’t faded over time, this is particularly seen in the blue of the sky. Two watercolors by Charles Demuth —Rooftops and Trees (1918) and In Vaudeville, the Bicycle Rider (1919) afford a nice contrast to the Homers. Beginning in the summer of 2015 and continuing for several months, the paintings will be integrated into the American galleries on the main floor of the West Building. This effort will continue into other galleries through 2016, when the East Building galleries reopen. This initial selection includes works from the Corcoran’s collection by artists across all European and American art historical narratives including Cy Twombly, Andy Warhol, Willem de Kooning, Georgia O’Keeffe, Edgar Degas, Mary Cassat, Edward Hopper, and Rembrandt among many others. This exhibit is well worth the visit. 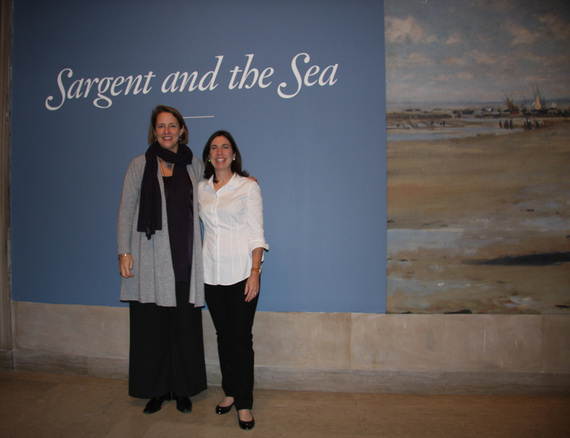 Sargent and the Sea Exhibition Curator Sarah Cash with Barbara Prey at the Corcoran Gallery of Art for their talk on Sargent and the Sea. Reproduced is Sargent’sEn route pour la pêche (Setting Out to Fish) which is currently on view at the National Gallery of Art.